It is probably safe to say that what draws many to this wonderful island of ours is the uniting of people from all walks of life who choose it for their home. San Pedro has grown to become a very popular tourist destination. Workers and business owners of various nationalities give their best to assure that our town is the number one vacation spot in Belize. This week we are happy to introduce a businesswoman who has come to San Pedro and excelled in our growing business world - Mrs. Elida Castillo. Elida was born in the very small community of Isabela Bank in the Belize District to humble, hardworking parents. She recalls that although her father was a farmer, with fierce hard work and sheer determination, he managed to provide his fifteen children with a good education. Elida graduated from Pallotti High School in Belize City in 1978 and then completed a one year Senior Secretarial Course at Belize Technical College. Prepared to face the challenges of life, she joined the work force in 1979 at Arnold's Construction Supplies in Belize City as a bookkeeper and sales clerk, a job she held for three years. In 1980, Elida married former Bank Manager, Alfonso Castillo. Their union produced three lovely children and their children, following in their footsteps, are determined to get a good education. Liliana, 18, is presently in her last year of Junior College; Candice, 15, is in her third year at Pallotti High School and Kristle, 13, is in her first year at San Pedro High School. Mrs. Castillo went to work for the US Peace Corps (Belize) in 1982, as a receptionist. In time she advanced to Executive Secretary and by the time she resigned, in 1991, she was the Program's Assistant. Shortly after, she found herself moving to the southern part of the country, namely Punta Gorda, where her husband had been transferred. Once there, she sought employment as an Office Manager with the International Reserve Committee, a non-profit organization that worked closely with refugees. Mrs. Castillo was involved with this project for two and a half years. 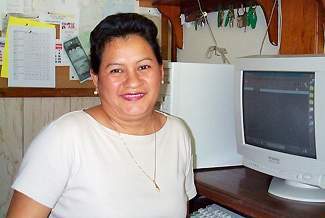 In 1995, Mrs. Castillo found herself relocating again, this time to San Pedro where her husband had been transferred as the manager of Belize Bank. Mrs. Castillo commented, "It took me some time to get adjusted to living in San Pedro. I thought it was a small village but I came to find that it was a surprisingly developed community and a totally different lifestyle than I had been accustomed to in Punta Gorda." Mrs. Castillo did not work for most of her first year on the island, giving her time to slowly adapt to the town. In December of 1996, she became employed as a bookkeeper/front desk agent at Paradise Resort Hotel. Two years later, she was promoted to General Manager. Today, Mrs. Castillo has the responsibility of overseeing the daily operations and supervision of sixteen employees. "Even though we are a small staff, we work as a team and use all our resources to ensure our client's satisfaction," said Mrs. Castillo. Some very visible changes that have occurred since her promotion have been the renovations of rooms, impressive landscaping, assuming management of the resort's bar and deli, and the computerization of office files and data in order to compete with the daily requirements of this busy enterprise. Although a businesswoman with many demands on her time, Mrs. Castillo is very supportive of town functions and is willing to be a part of anything that will benefit this community. She said, "I think development is good as long as we do not lose our culture, tradition and moral values. I personally find it very sad to see that the youth have a limited amount of healthy activities to occupy themselves with here. I pledge the support of myself and Paradise Resort to making a difference in this aspect." Five years after moving to San Pedro, Mrs. Elida Castillo feels perfectly adjusted and now adds to the multi-faceted business personalities that make "Our Community" - Paradise.